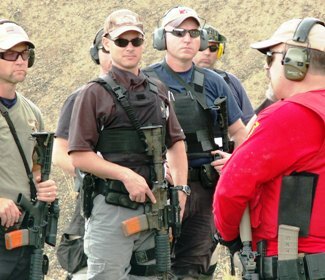 A practical firearms combatives program is not easily arrived at with current instructor development programs of one-week "train-the-trainer" courses. A superb training course is nearly impossible without advanced instructor development that can only be achieved through an expert mentoring program. CUTTING EDGE TRAINING instructional staff are truly master craftsmen in the development of police training cadre. We will bring our proven expertise in training the trainers of law enforcement in the integrated approach to all force skills, tactics, and decision-making and assist your training staff in creating a rational, cost-effective, and defensible force and firearms training program for your agency. CUTTING EDGE TRAINING is known throughout the national police community as having the highest training standards and the most innovative, comprehensive, and functional training programs in the business. Each of our training programs are the "cutting edge of training" because we bring a 100% integrated approach to the training process that consistently functionalizes the combatives and survival skills of your officers. We provide the ability to dramatically increase your agency instructors' expertise--regardless of the topic. The application of force laws and reasonable decision-making. The articulation of force response decision-making. Handgun, rifle, shotgun employment and range training through integrated Effective Combatives Problem-Solving. Combatives solutions within the deadly force environment. We are able to provide references nationwide of agencies for which we have provided this service. Take the next step in demonstrating your commitment to the most professional policing practices and skill development your can within your agency--engage our mentoring consulting services and let us make a difference in your agency's training today. Ask about how we assist you in creating an integrated "force training cadre." Prepare to be amazed at how good your agency's training staff can be!